Published on 18 December 2015, by M. Tomazy. On 31 May 2010, Mavi Marmara the flagship of Gaza freedom flotilla was attacked in the international waters of the Mediterranean Sea by Israeli special forces. Nine Turkish activists were killed in the attack. The flotilla was heading to Gaza strip in attempt to break the siege. The Turkish-Israeli diplomatic relation was frozen following the attack and Turkey withdrew its ambassador and expelled Israel’s ambassador in February 2011. Nevertheless, the economic ties have never been negatively affected and the double-taxation prevention treaty remained valid despite the diplomatic tensions. Turkey laid down three conditions for the normalization with Israel. The first condition was an apology from Israel. The second was the payment of the compensation and the third one is to end the blockade on Gaza. However, Turkish and Israeli officials met in Switzerland on Thursday where a preliminary reconciliation deal was set to be reached between the two countries, a senior Turkish official said. 4. Turkey will expel Saleh al-Aruri, a senior member of Hamas' military wing, who is based in Istanbul. According to the leaked items, Gaza blockade will not be completely ended although it was the reason for murdering nine Turkish activists in the international water of the Mediterranean sea. Their mission was clear; to break the siege over Gaza. "Turkey is preparing to cut imports of LPG from Russia by a significant 25% next year. This puts a major damper on the Gazprom -Botas Petroleum Turkish Stream project, a project that was designed to connect Turkey to Europe through Greece. When that deal was discussed, U.S. Secretary of State John Kerry lobbied the Greek government to diversify its supply by turning to U.S. fuel instead of cheaper Russian imports." 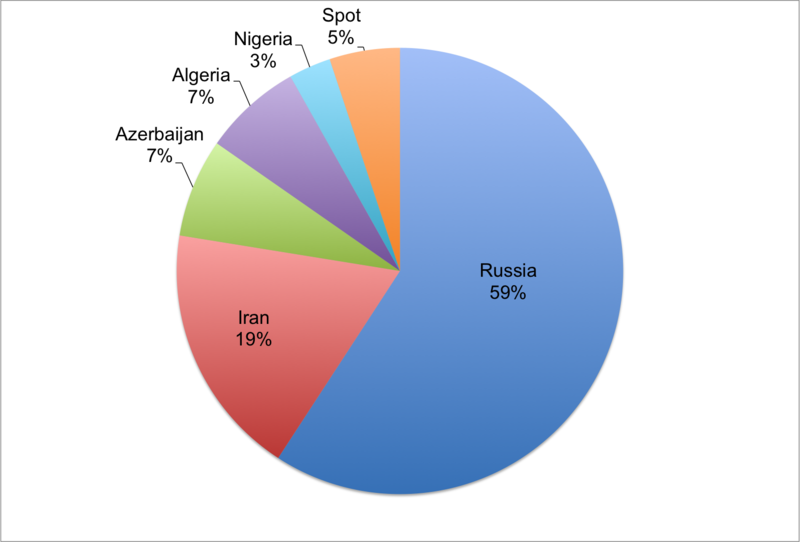 Fifty nine percent of Turkey's gas imported from Russia, and Turkey seeks to replace the Russian gas with Israeli one. The sales volume from Turkey is equivalent of 17 percent of Gazprom’s total exports outside the former Soviet Union, according to company data. On the other hand, Israel is looking forward to export its gas to Europe, which is about 500 km from Israeli coasts and Turkey constitutes a feasible route. Turkey also controls parts of the Mediterranean island of Cyprus, between Israel and Europe. Israel's natural gas could go to Europe through Turkey since building pipelines under the Mediterranean is costly and difficult. The Leviathan gas field is believed to have a reserve of more than 620 billion cubic meters.